As we intended to have a quick early morning visit to the Keoladeo Ghana National Park, I got up early to once again be vanquished by the morning fog and therefore, we waited out till the weather cleared up. Having had our breakfast comprising of Bread & Omelets, we proceeded for our days’ scheduled excursion to Deeg. Situated about 34 Kms. north of Bharatpur is this beautiful garden town of Deeg, the capital of Jat Kings of Bharatpur. Geographically it is located at an altitude of 174 meters over mean sea level and placed in co-ordinates of 27.47 degrees North (Latitude) and 77.33 degrees East (Longitude). 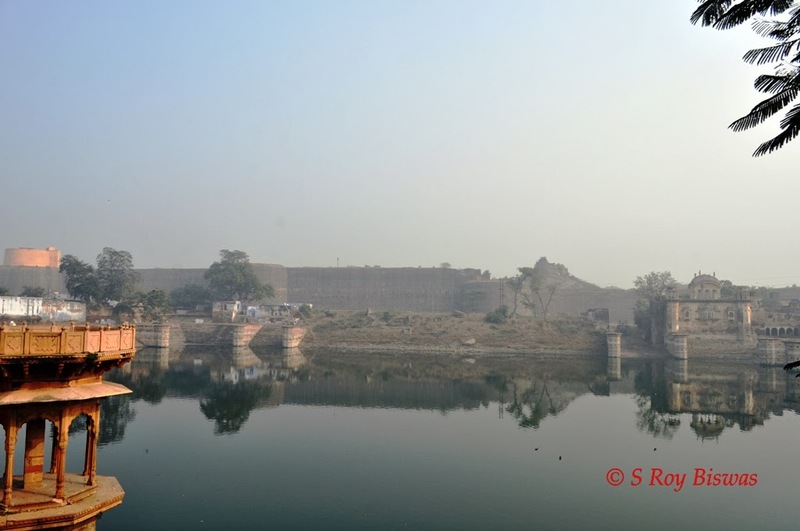 In 1733 AD, Raja Badan Singh’s son, Suraj Mal had captured the fort of Bharatpur from Khemkaran, the rival chief, whom he killed and thus, laid the foundation of Bharatpur City. Deeg in the 18th century was the capital of Jat rulers. The central citadel, set up in 1730 is square in layout and stands on a slightly raised ground. The whole monument is encircled by a shallow wide moat. 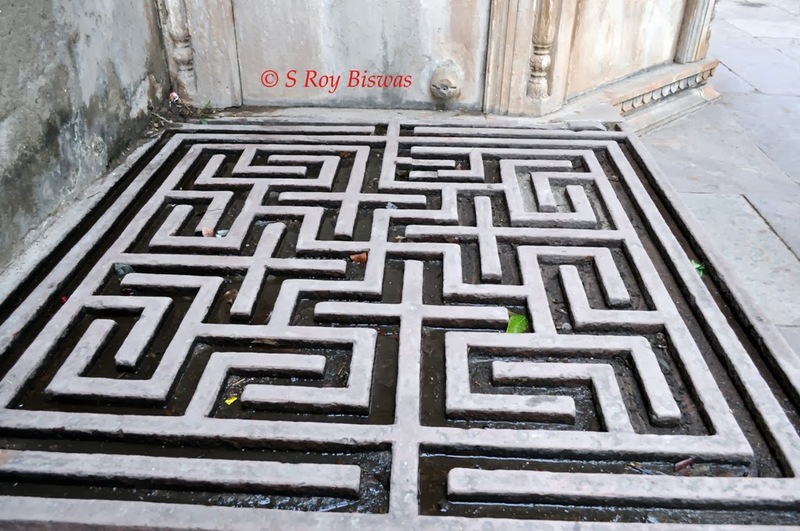 The protective walls are 8 km in circumference pierced by 10 gateways and studded with 72 bastions. The gateway to the fort is protected with anti-elephant strikes. The most impressive are its huge towers, haughtily standing upto the sky. The towers are fitted with cannons to take a sound shot at any approaching enemy. 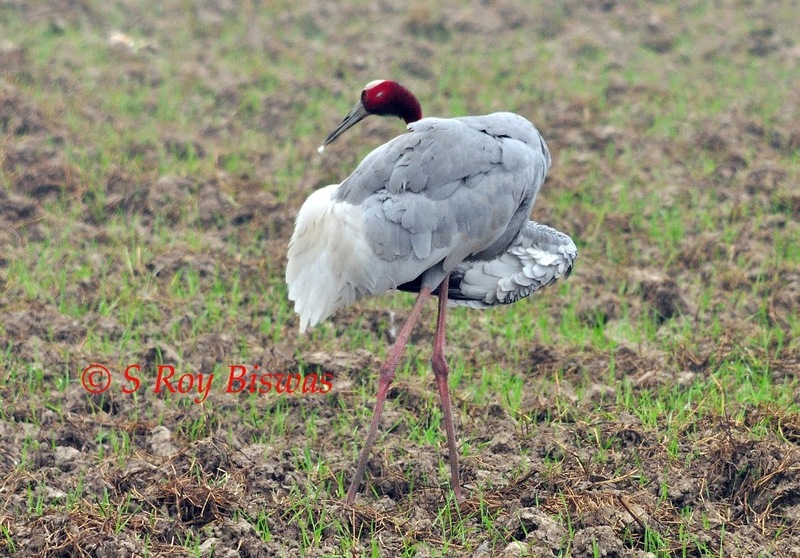 We drove through the Bharatpur city till we hit upon the Alwar Road and have traversed some distance on this road, we suddenly we spotted a pair of Indian ‘Saras’ cranes, which had not made a show at the Keoladeo Bird Sanctuary this season. So we got down and embarked upon our usually activity of shooting the birds!! Of course with our Cameras, despite the fact that it was still quite overcast. 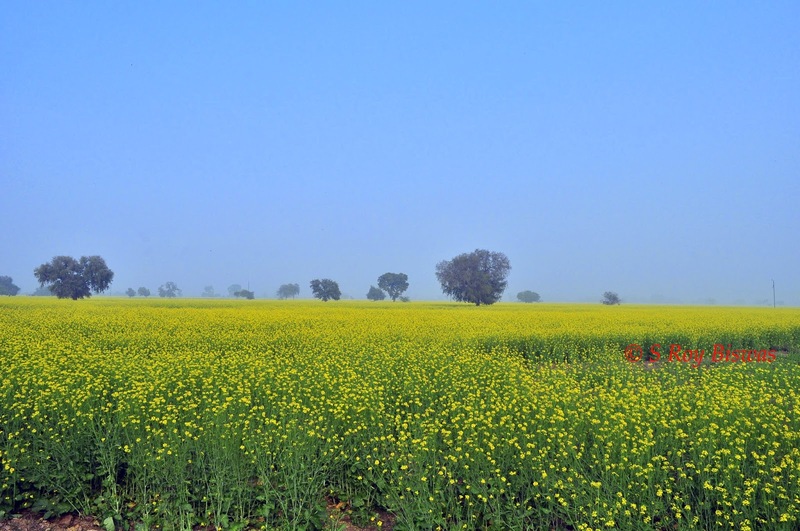 Having observed the Cranes for some time, we headed towards Deeg, the road was in excellent condition coupled with a riot of Yellow (read mustard in bloom in fields adjacent to the road) thrown on either side of the black tarmac, the view was mesmerizing. 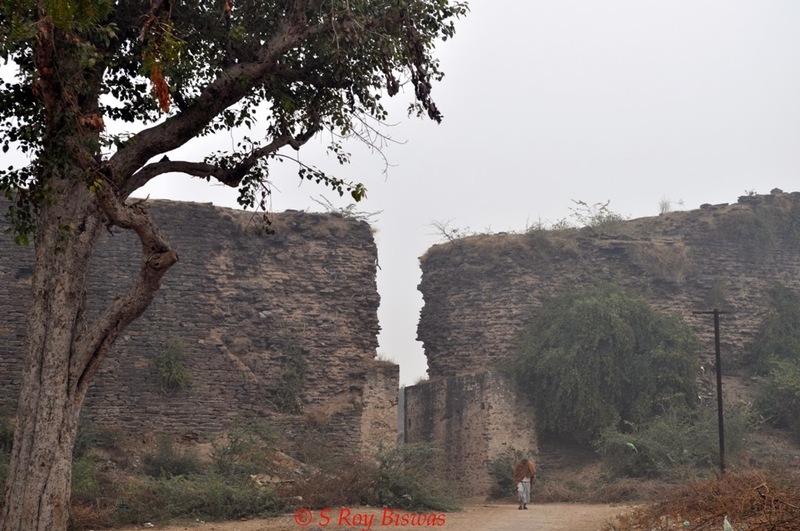 We made our way to the Deeg township having gone past the old village and there from headed towards the old fort. 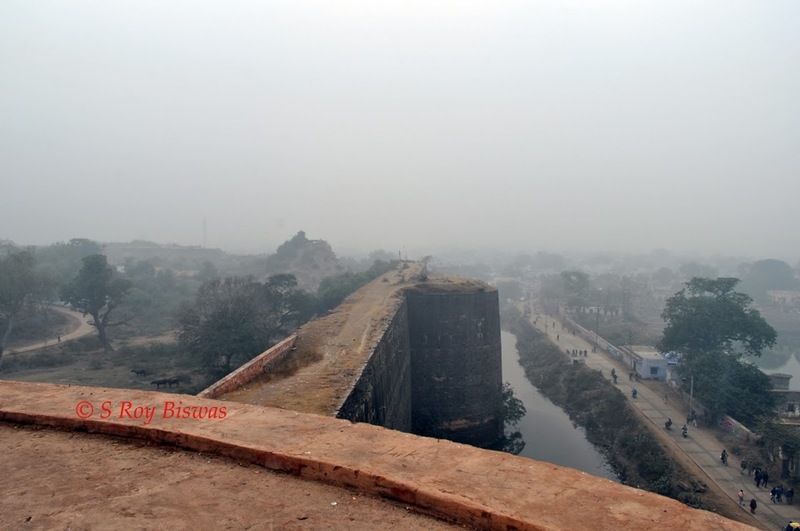 The entrance to the Deeg Fort is by a draw bridge in the north and through a gateway protected with anti-elephant spikes. One can drive through this road, but albeit a bit carefully, as it is narrow, with no tarmac and at best can be described as a dirt track. 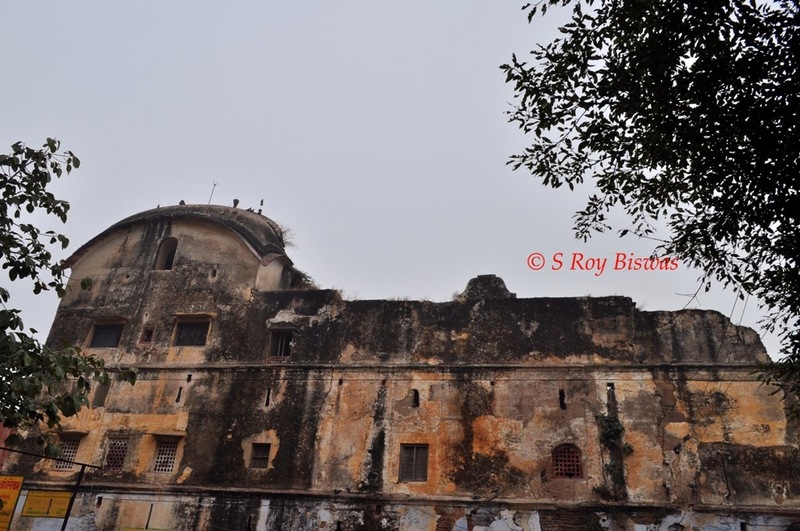 But the most impressive part of the fort is its huge towers which stand haughtily piercing the sky. 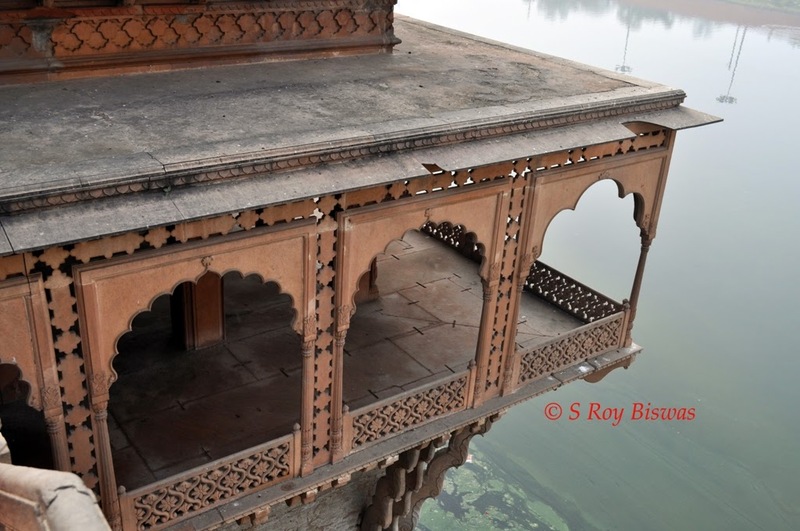 There are 12 (Twelve) in all, the largest being the Lakha Burj in the north-west corner. 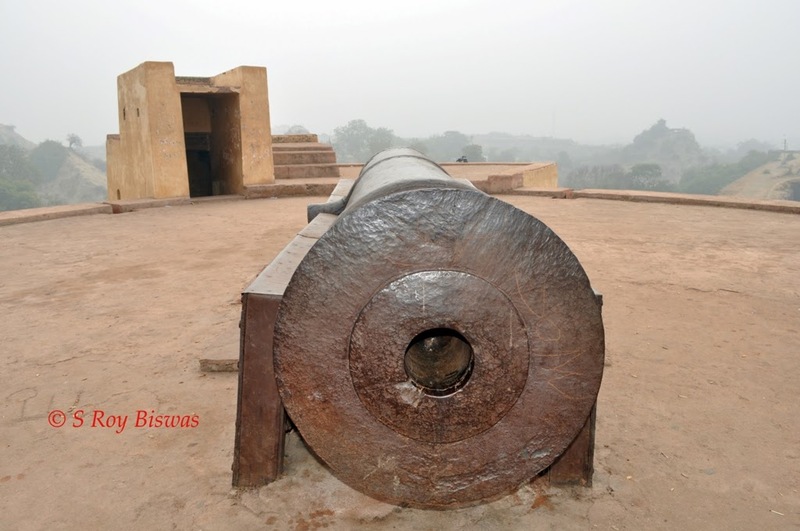 These towers were fitted with cannons to take a pot shot at any approaching enemy. 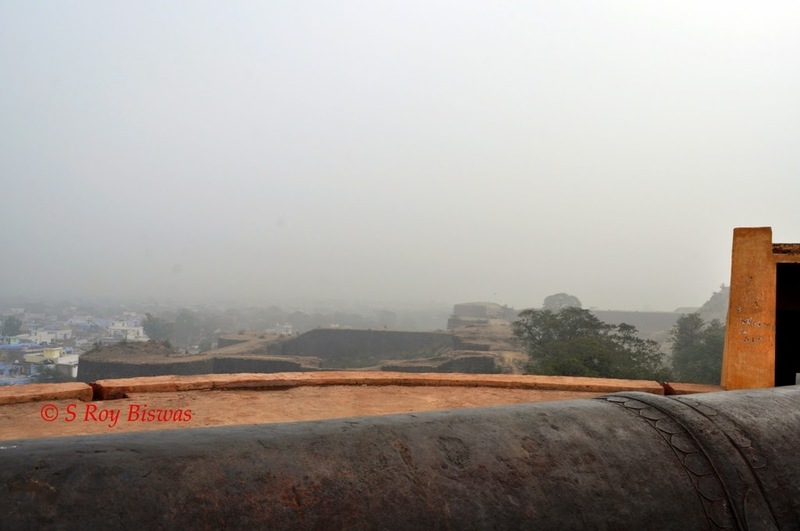 The cannon of Lakha Burj is still well preserved. The Suraj Mal Haveli is a nice structure, with its typical domes of the bangaldar style. This kind of a shaping is based on the Bengali curved bamboo roof, probably imported to Rajasthan by the Bengali architect of Jaipur, Vidyadhar Bhattacharya. In fact, such rounded roofs are the high point of Deeg's pleasure palaces too. Next we proceeded towards the Palace in Deeg and as it was getting intensely cold, we first had a cup of Coffee each at the entrance of the Palace in typical Indian mud baked cups called ‘Khullars’. 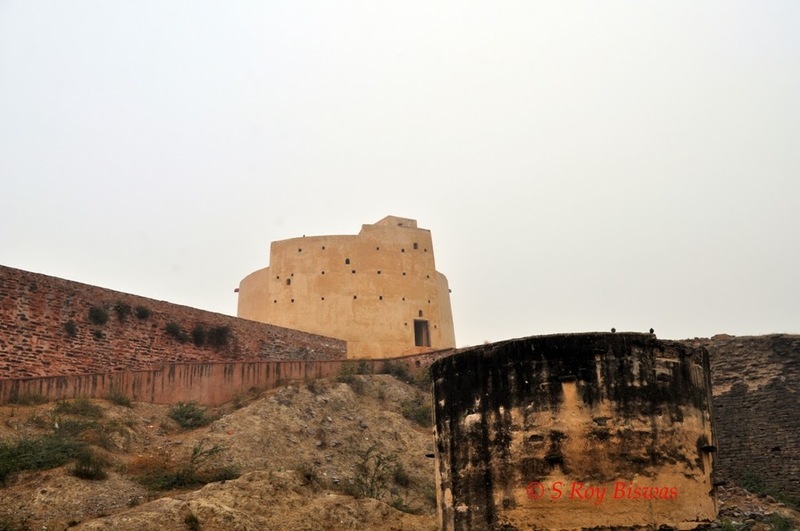 A brief history of the place is as follows – Initially Maharaja Badan Singh was a small Chieftain who wanted to become the Ruler and sought the favour from the Kings of Jaipur, under whose jurisdiction the area was demarcated, but was refused the honor. 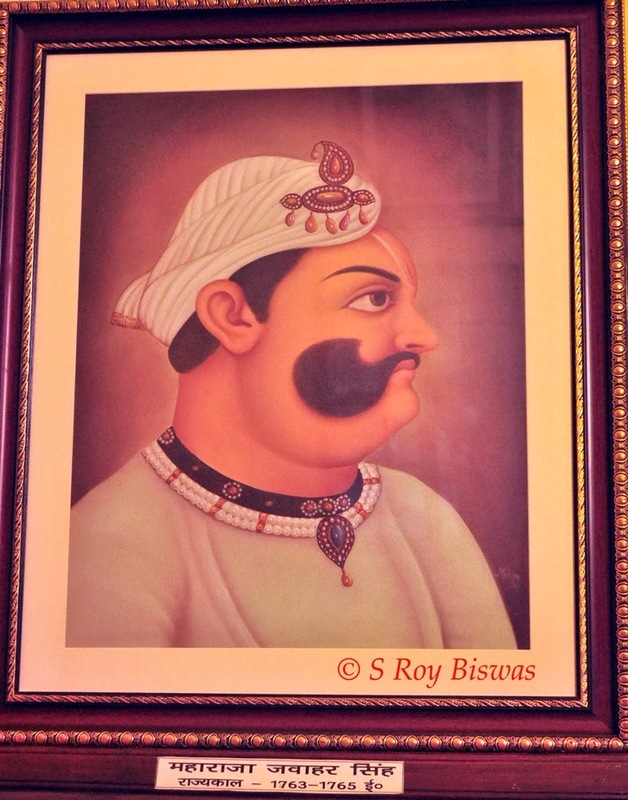 Peeved on being denied, the Chieftain started looting the plundering government treasuries etc., which compelled the Mughals to direct the Mahraja of Jaipur to cede to his demands and thus, he was declared a King of the State of Bharatpur. His son Maharaja Suraj Mal displayed immense courage and carved a niche for himself in the midst of political disorder. Gathering around him fiercely martial Jat peasants, he went from one success to another. 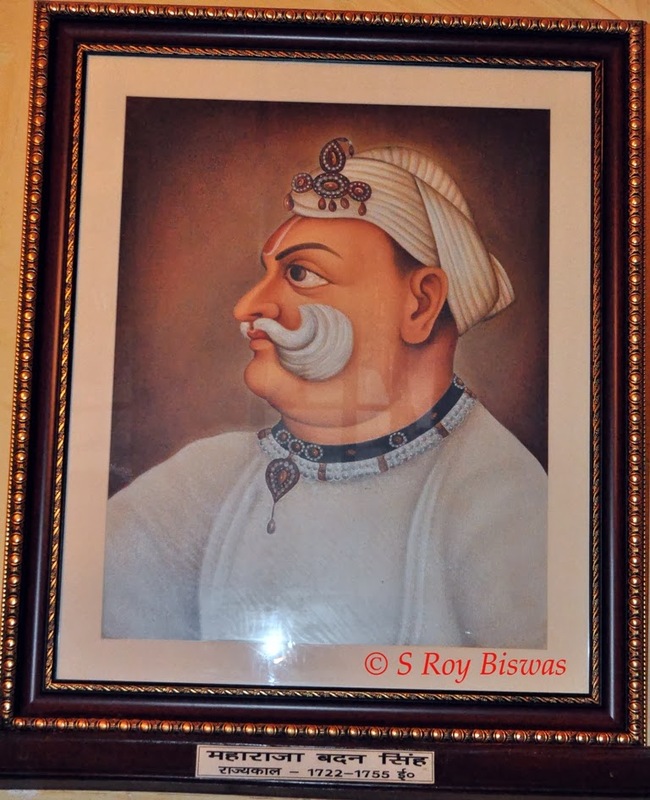 He accompanied Emperor Muhammed Shah against Ali Muhammed Ruhela and in 1748 AD, at the battle of Bagru, he led the Jaipur vanguard against the Marathas. He also defeated the commander-in-chief of the Mughal emperor. Despite being a very religious man he was secular. He built the Palace in Deeg with the gardens having being laid with great care and precision, the sparkling fountains and meticulous palaces add to he beauty of this idyllic retreat of the princes of Bharatpur. He was killed by the Mughal General using treachery on 25th December, 1763 who beheaded him and cut off his hands too and carried them back to Delhi. His son Maharaja Jawahar Singh, being taunted constantly by his mother who had adopted him i.e. Maharani Kishori regarding the treachery of Mughals and carrying away the head of his father to Delhi, prompted an attack on Delhi in October, 1764 and he laid siege upon the city for months. 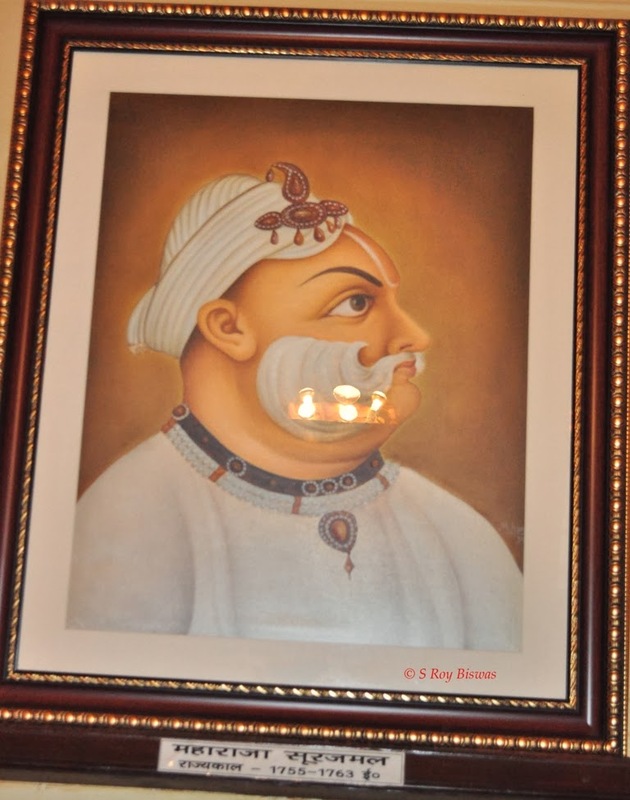 He left after having been granted a beneficial treaty including cost of the war by the Mughals. However, he still plundered the Red Fort of Delhi and took away the door of Chittorgarh fort that was taken away by Maharaja Akbar. 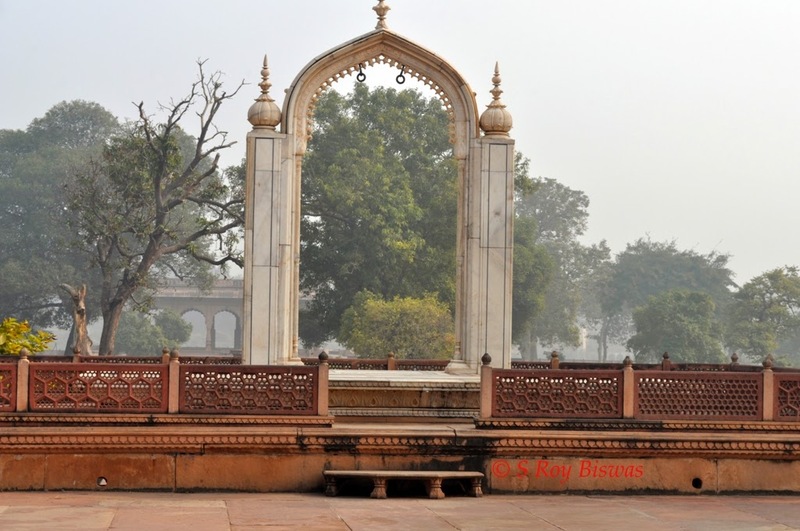 He also carried away with him the swing of Empress Noorjahan and other stone artifacts, which he thought was the part of throne, but later turned out to be granite slabs on which the Royalty (read Mughals) were bathed & robed after demise. All these artifacts are there in the Palace for one to see. 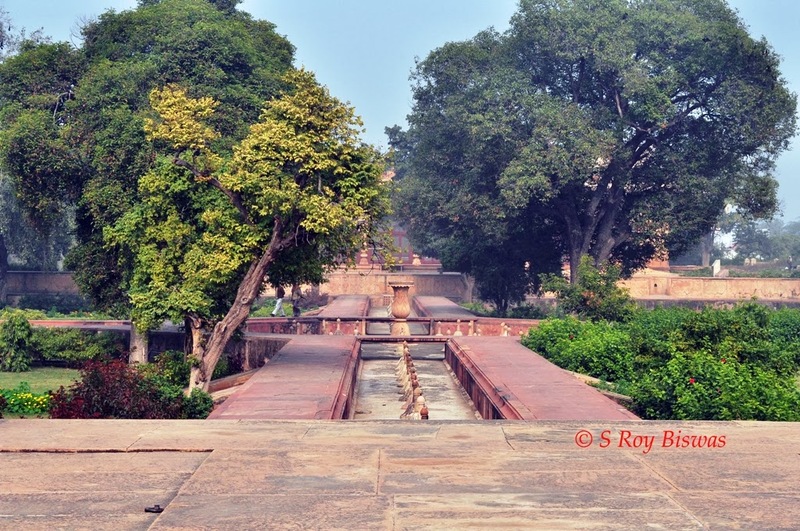 The outstanding feature of the Palace is its 2000 odd fountains that spew colored water. The water is stored in a huge reservoir of 6 lakhs gallons capacity, which used to be filled up using Cattle draw well technique during the medieval times, taking almost 20 days to fill it to the brim and even as on date it takes two days to fill it up by using electric pumps. The flow of colored water in the fountains was an ingenious design, as there were several burnt clay pipes inserted in the reservoir side that carried water to the fountains with specific markings. When the fountains are closed, these were inserted with wooden poles and when water was required to be released cloth bags containing colored vegetable dyes were stuck at the exit end and as the water flowed through them, the water absorbed the colors and thus created an aura of color & fragrance. The fountains are still in working condition but they are made functional only twice during a year, once during the rainy season of July/August on occasion of ‘Teej’ festival and on 4th February every year for the special invitees. The tourists enjoy the charming settings of this agricultural town, along with the well preserved palace pavilions and gardens. Some very interesting buildings can be observed within the Palace precincts are as follows, however, no photography is allowed inside these ASI protected buildings. 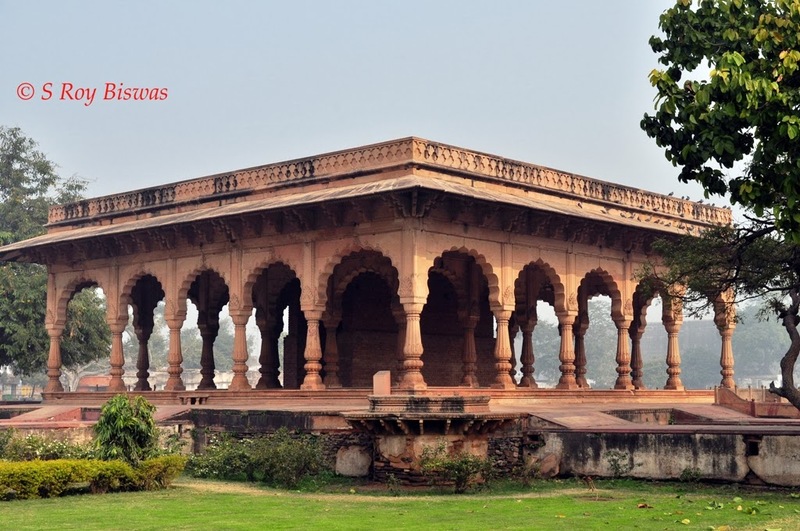 Completed in 1760, an imaginatively designed building complex with beautifully laid gardens at its entrance and the rear overlooks the Gopal Sagar which is flanked with smaller pavilions Sawan and Bhadon. The formal gardens face a raised terrace with an arch of lustrous marble installed on a pedestal in the form of swing. This exquisite swing is a war trophy brought in by the famous Jat king Raja Suraj Mal from the Mughal court in Delhi. The spacious and well proportioned Banquet Hall has a double row of graceful pillars. The rear of the chamber is further divided by a charming sunken pool with fountains. The Banquet hall houses a rich collection of curios, souvenirs and Victorian furniture. Staircases wind upstairs to the upper floors. One room contains a solid black marble bed from Delhi. 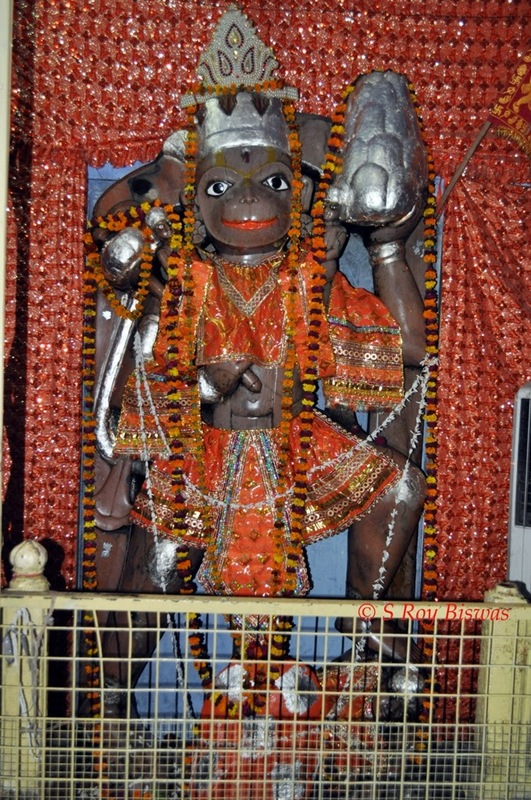 Behind this building is housed the temple dedicated to Lord Hanuman and the statute is made up of reddish brown Jade and is South facing, in honor of the fighting capabilities of the deity shown during the war with Ravana in South of India. It houses the dining room, and has sloping arches, with comfortable cushions along the outer edges forming the seating area. 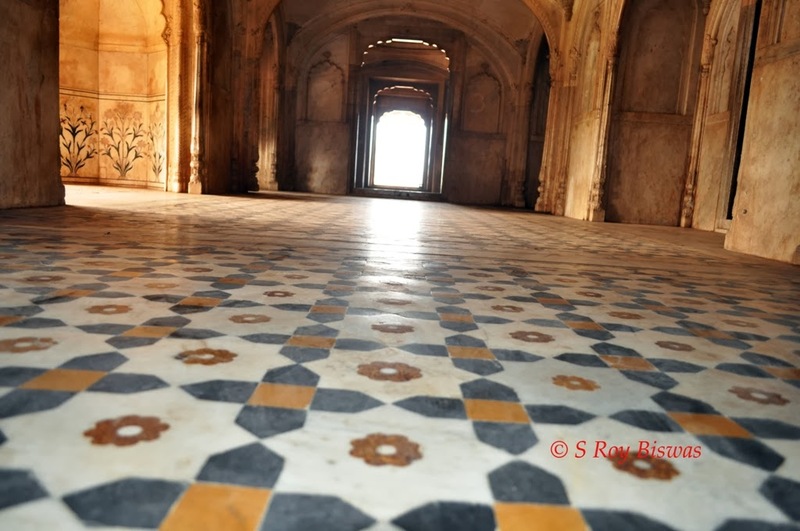 It is a two storied complex with the upper one with seating arrangement on the floor with raised platform in the middle made of marble with an entry/exit point for servants, for serving the Royals. The lower floor consists of typical European dining table that could host about 100 guests at a time and was used to host the Britishers etc. Adjacent to the upper Dining room is the royal Chess Room, which has trellis design and is painted in soft red color. 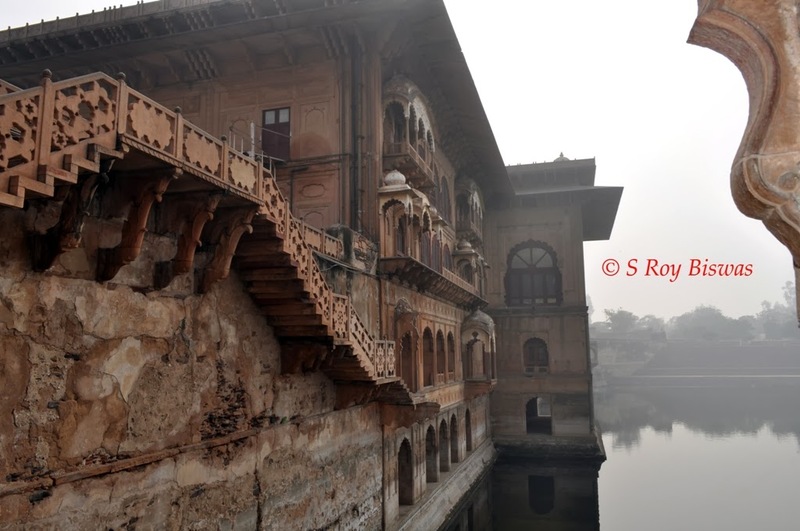 To the east of the main building, this palace has balconies overhanging the water. The entire palace in marble is like an airy pavilion with fine ornamentation within the apartments. 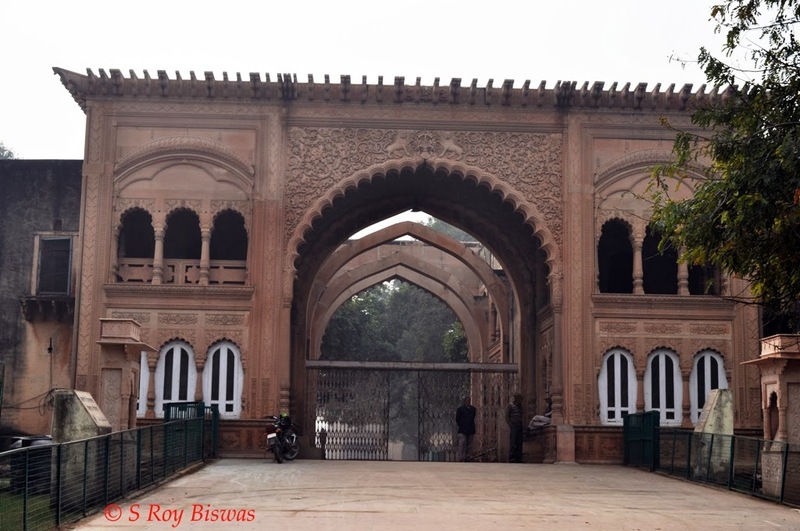 The guide informed us that this palace was reserved for the guest’s of the Royalty and was in fact the Madrasa (teaching place) for the Mughal rulers of Agra and during the occupation of the fort by the Jat Kings they had removed the entire building and re-constructed it in Deeg. 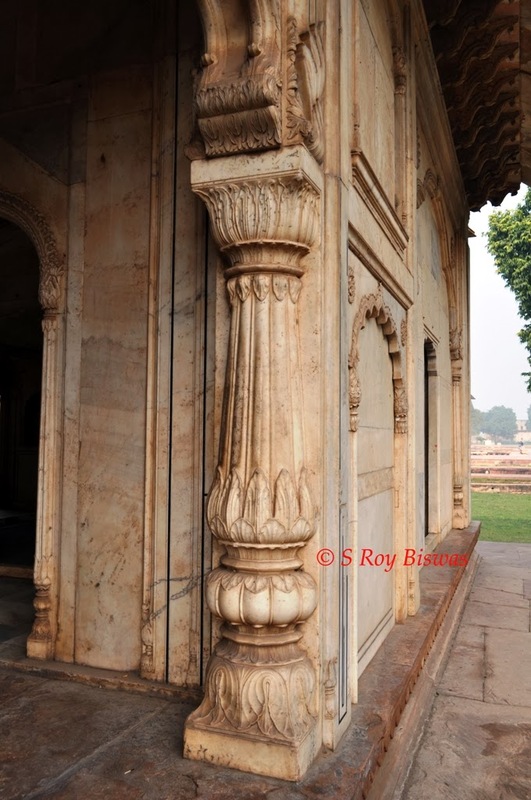 He tried to defend his theory by stating that the Jat Kings did not have access to quality marble or trained artisans for the same and that the entire palace had been constructed in sandstone and the local artisans were apt in sandstone cutting, rather than marble. It is a large audience hall. 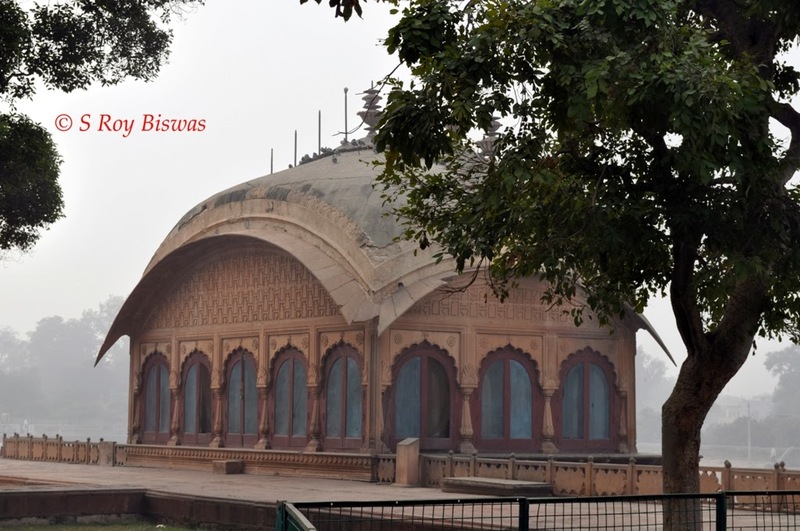 KRISHNA BHAVAN, and the ingeniously designed water works of KESHAV BHAVAN, with open twelve pillared pavilion are of great interest. Here the water used to gush in with speed upto the Keshav Bhavan roof and at the entry point of each pipe a round sandstone ball was placed and the water pressure displacing the ball and ball hitting the masonry would create a sound and all of the balls striking together would create a noise akin to thunder and with the water falling in cascades through various pores of the roof and walls, would create an aura of a rainy day. 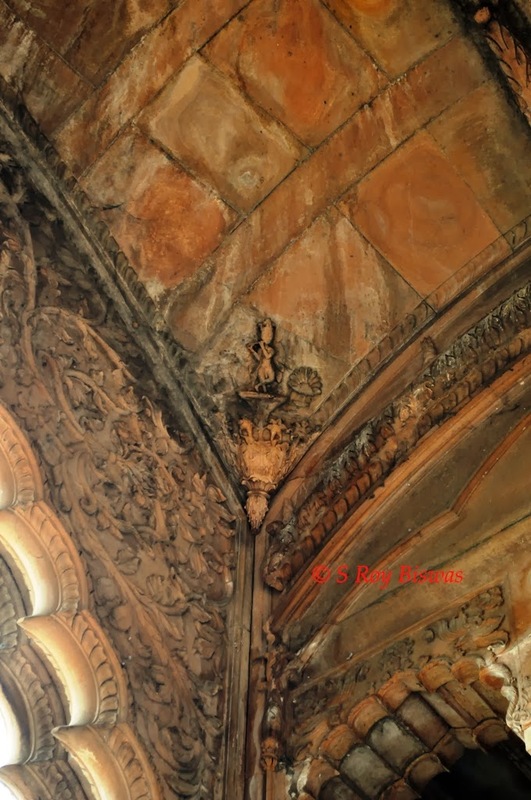 As the roof is caving in, the ASI has constructed a grotesque wall in the middle of the building, thereby destroying the basic vision of the structure. 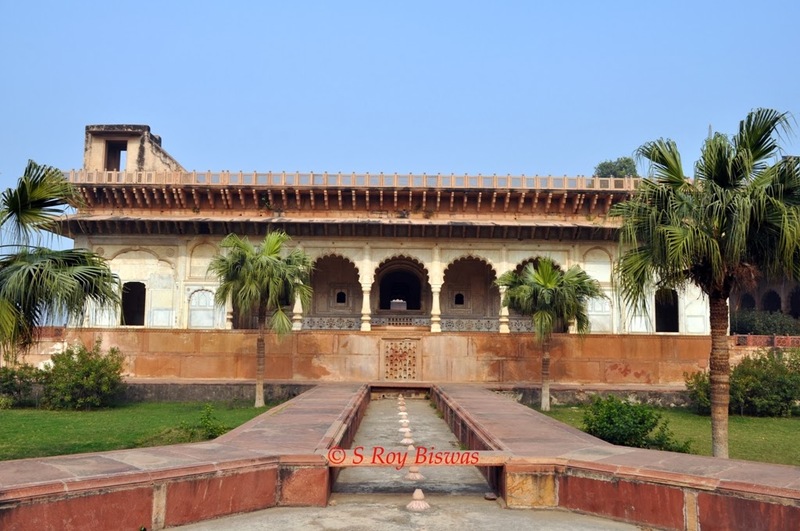 It is the oldest palace, planned as a spacious rectangle encircled by compartments and chamber, it has a collection of some very fine Rajput and Mughal schools. Deeg is of religious significance as well as it is in the Braj Bhoomi i.e. land of Lord Krishna and as per Hindu Mythology, Deeg comes in the path of the Parikrama of Lord Krishna that starts from Goverdhan parvat, about 12 Kms. from here. The region is also known as ‘Braj Bhoomi’ that literally means ‘land of Lord Krishna’. Deeg also find mention in ancient Hindu scriptures of ‘Skand Purana’ as ‘Dirgha’ or ‘Dirghapur’. 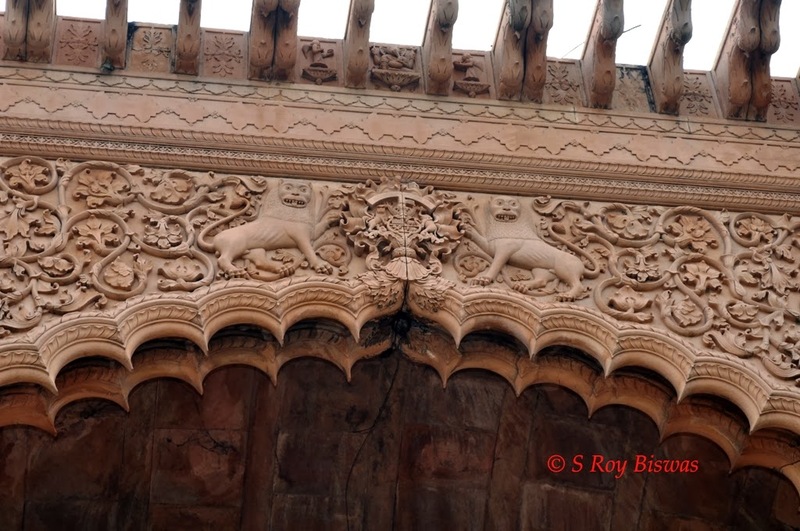 We spent the entire day at Deeg and returned to Bharatpur in the late afternoon, as we were to return back to Delhi the next day after having visited Sariska on the way back. Good information your blog, thanks for shared!!!! We are a top best high quality marble, granite and stone dealer, supplier, manufacturer or exporter in India. We are available marbles products with reasonable price. Nice article and great knowledge. Thanks for the share. S Roy Biswas. Picture Window theme. Powered by Blogger.